Originally from South Africa, Ashley arrived in Perth, WA with her family in 2000. She later moved to the Sunshine Coast, Queensland where she enrolled in a Bachelor of Biomedical Science at the University of the Sunshine Coast. During her undergraduate studies, Ashley completed a Special Research Project, examining the role of heme oxygenase in anti-inflammatory responses to omega-3 fatty acids. With a taste for research, Ashley enrolled in the Bachelor of Science (Honours) this year under the supervision of Drs. Fraser Russell and Peter Brooks. 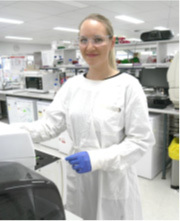 She has commenced investigations into the antioxidant activity of Australian honeys as part of the CRC initiative, and has already travelled to Perth to investigate the antioxidant activity of some of the West Australian honeys with Dr. Ken Dods and his team at the ChemCentre, WA.